you are interested in the the church’s role in relation to the state. you are interested to growing in your understanding of the church as an institution. The church is political. Theologians have been debating this claim for years. Liberationists, Anabaptists, Augustinians, neo-Calvinists, Radical Orthodox and others continue to discuss the matter. What do we mean by politics and the political? What are the limits of the church’s political reach? What is the nature of the church as an institution? How do we establish these claims theologically? Jonathan Leeman sets out to address these questions in this significant work. 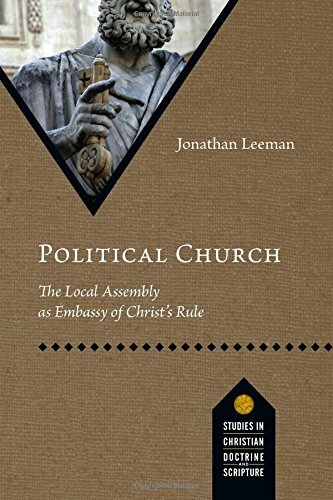 Drawing on covenant theology and the “new institutionalism” in political science, Leeman critiques political liberalism and explores how the biblical canon informs an account of the local church as an embassy of Christ’s kingdom.Political Church heralds a new era in political theology. After reading Don’t Fire Your Church Members: The Case for Congregationalism, I was looking forward to venturing into another of Leeman’s books. Don’t Fire… and Political Church were both published under the academic labels of their respective publishers (B&H and IVP). And both live up to the academic standards that both of these publishers maintain. However, Political Church landed on some very similar conclusions based on the same arguments espoused in Don’t Fire… Leeman has taken the same set of exegetical verdicts from Matthew 16, 18, and 28 that he applied to ecclesiology in Don’t Fire… and adapted them to explore the political nature of the local church as it relates to the State and the world at large. Said more clearly, Don’t Fire… takes Leeman’s understanding of the “keys of the kingdom” described in Matthew 16 and the rights that come with those keys (described in Matthew 18) and draws out implications for the way in which a church should function internally. In Political Church he employs the same basic ideas and applies them to what the role of the church as it exists externally, as a part of a community. His conclusion is that the local church is a political entity with the rights to represent Jesus, display his justice, and herald his claim upon the nations and governments of the world – not just another volunteer organization. The church is an embassy of Christ’s Kingdom here on earth. But what does that mean? So what? His conclusion then, is that these truths should drive the church to be more, well, political. But not in the ways in which you might think. Not by burning a flag, but by raising high a flag – the flag of Christ. Not by turning in on itself in an effort to keep the dangerous world out, but by opening its doors to the community in order that they might “exemplify to the nations what a true politics looks like.” Not to cast judgment on their neighbors for their pagan practices, but to broadcast light to their neighbors in order that they might, “discover a society of people who are not perfect but who know they are not perfect.” Not to condemn others, but to expose a people who realize that their sin merits condemnation from the King who possess all authority but that this king is also beneficent and forgiving. Not to rage about the current status of our government, but to proclaim that, “no constitution, no political campaign, no classroom lecture, no book of political theology will stop the inexorable march of death, deal the nations and produce a just and lasting peace” – only the hope of Christ’s return will usher in such a society. I love Leeman’s conclusions. But I would be remiss if I did not warn the readers of this review that the road to get to those conclusions is difficult. I had friends that lived in South Sudan for a while and they told me the horror stories of the road there and how driving only a few miles could take hours. This book felt a bit like driving the roads of South Sudan. It took me several months to read this book because I had to read it really slowly in order to follow Leeman’s arguments. Washington Times reviewer Scott Lamb notes that this book, “isn’t fast-food reading. You can’t eat it quick, but it will leave you feeling nourished.” I agree with Lamb to a certain extent – I was nourished, but I was also exhausted. I commend this book to you, but be sure to go in with eyes wide open. It might take awhile – and that’s okay. Buy some new highlighters, prepare to take copious notes, and dig in!